and her extended family who contributed to it. Now Ready!The Daily News Cookery Book, followed by a drawing of a demure saree-clad lady stirring a mysterious (but obviously delicious) something in a pan on the fire. Under the image the advertisement stated that ‘cookery is a pleasure to the Ceylon Housewife now that she has the ideal cookery book for which she has waited so long’. Thus with 700 selected Dutch, English, Portuguese, Indian and Ceylon recipes and useful hints for the Ceylonese housewife, the Ceylon Daily News Cookery Book was born. This slim volume (7½”x5”) was the first locally produced cookery book in Colonial Ceylon and was sold at Rs.3. A number of advertisements in a similar vein were to follow in the next few days but only on the 6th of July 1929 did the Ceylon Daily News carry the name of the editor of the book, Miss H. Deutrom, who for many years would remain a largely obscure figure. Her book on Ceylon cooking however went on to become a household name. 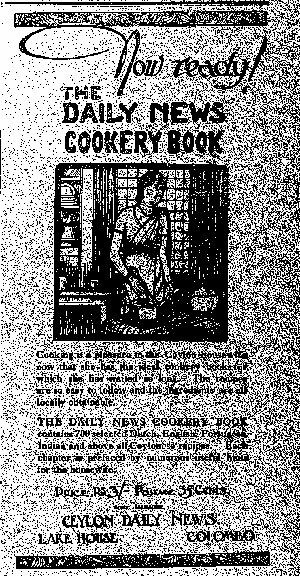 The Daily News Cookery Book hit the shelves in 1929 followed by four subsequent editions and numerous reprints. A Sinhala edition known as the Dinamina Cookery Book first appeared in 1930 and like the English version has been revised and published a number of times. In modern parlance Hilda’s name is used to validate the ‘authenticity’ of lamprais in online battles on YAMU and she has made brief appearances in the fiction of Yasmine Gooneratne’s ‘Change of Skies’ and Romesh Gunasekera’s Reef. Anita Mannur in ‘Culinary Fictions: Food in South Asian Diasporic Culture’ writes that Hilda Deutrom’s cookbook is a ‘script to articulate diasporic Sri Lankan identity’. For the rest of her life Hilda’s name and the Daily News Cookery Book went hand in hand, but as the success of her book grew, Hilda receded further into the background with memories of her limited to close family and friends. This article is written in memory of Hilda’s niece and god daughter, Kathleen Deutrom (May 17, 1919 – September 7, 2015), who in March 2015 sat down to discuss Hilda, her life and her reasons for writing a cookery book. Hilda Gladys Deutrom was born on the 17th of March 1884 to Abigail Maria Anthonisz and James Vincent Deutrom. She was a premature baby, born at eight months and as a result was termed delicate or semi-invalid for the rest of her life. Hilda had four brothers, George, Percival (Percy), Hugh and Bertram and one sister Vivienne. The family grew up at Seaspray, a house located close to the Mount Lavinia Railway Station. 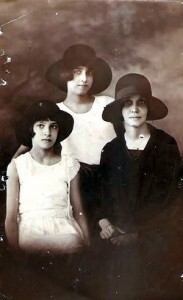 After Percy married his cousin Edith Anthonisz, Hilda first became an aunt to May (1917) and then to Kathleen (1919). The Deutroms were closely associated with Lake House and the Daily News because of Percy’s friendship with the founder D.R Wijewardene. He was Percy’s employer and the family fortunes of Hilda’s brother rested to a great extent on Wijewardene’s affection and generosity. Kathleen recollected that when her father Percy started to work at Lake House, he got his sister Hilda to send recipes to the newspaper for publication. They appeared in the Daily News column ‘Woman’s Ways’ which had a section titled the ‘Cookery Column: Selected Recipes compiled by a Connoisseur’ with recipes which ranged from Liver Cutlets to Coffee Jelly. A Mrs. Huntsworth, who was in charge of the Women’s Column at the newspaper, suggested that Hilda should compile a cookery book and for inspiration she turned to a magazine in circulation at the time called the Family Herald. In 1929, when the first edition of the book was published, Hilda wrote that “a certain number of the recipes included in this volume have already been published in the columns of the ‘Daily News’”. Perhaps the best kept secret about the compilation of the Daily News Cookery Book is the fact that Hilda Deutrom was not the cook. According to family lore Hilda wrote and compiled the recipes while her sister, Vivienne Woutersz, sharpened her culinary skills by testing out the recipes before they were included in the cookery book. In Hilda’s own words ‘Every one of these is a tried recipe and if the directions are followed carefully there should be no failure’. Kathleen believes that the Dutch Recipes came out of her grandmother’s (Hilda’s mother’s) kitchen. Her memory of her grandmother making Poffertjes (light dough fritters/little puffy pancakes) in her special Poffertje pan reinforces this. The Poffertjes were eaten at tea-time with sugar syrup or maple syrup and Kathleen voted them ‘delicious’. In the past, cookbooks were not tied to one particular celebrity author but instead were the result of either un-named compilers or collective authorship. In the West a cookbook originated from home kitchens and represented a community’s favourite recipes with publication providing a method by which to refine ‘the community’s repertoire of dishes’. It seems that through the Daily News Cookery Book, Hilda was invoking the same principles found in the community cookbooks of the West. Old single-rule exercise books, dating from the 1940s, 1950s and 1960s, were found in Hilda’s last home, ‘Middelburg’, located down Circular Road, Mount Lavinia. Words, dates and numbers spill out of their pages as they list numerous recipes, ingredients and the cost as Hilda and Vivienne seemed to have taken orders for catering as well. In 1943 Mrs. Ohlums placed an order for 4 dozen fuggettis which cost her Rs. 4.80. The Deutrom sisters sold 90 lamprais to ‘Doreen A’ at the rate of Rs.1 per lamprais in 1949 but by 1962 the price of a lamprais had increased to Rs. 1.25. However what is most significant about these exercise books is that some of the recipes are accompanied by bracketed names of friends and family members, suggesting the possible source for the recipes. There was Enid’s Love Cake, Sylvie’s Passion Fruit Syrup, Lou Deutrom’s Pork Pies, Cecile Anthonisz’s Cream Buns and Sardine Rolls, Elva Poulier’s Chinese Rice and Hilda Deutrom’s very own Date Cake. The two sisters, Hilda and Vivienne, along with their extended Deutrom family are remembered for their specialty Beef Badun, Chicken Mulligatawny, String Hopper Pilau and Seeni Sambol all of which grace the pages of the Daily News Cookery Book. At Christmas time visitors to Middelburg (and other Deutrom households) would be served Mince-Pies, Kisses, Love Cake and Christmas Cake which was accompanied by Patties, Cutlets, Iced-Coffee and home-made Ginger Beer. The back verandah of Hilda’s home was also used for preparing and assembling the different curries included in the lamprais, which was a staple favourite in most Dutch Burgher households. Described as a careful and wise spender, Hilda contributed to the building of Middelburg, which was the house that her brother-in-law Claire Woutersz constructed for her sister Vivienne, who was his wife. For when the house was about to be completed Claire ran short of money and Hilda stepped in with the little money she had saved in the bank -accumulated from the sale of the Daily News Cookery Book – to help finish building the house. Hilda was to live out the rest of her adult life at Middelburg where she had her own quarters. When Hilda was older and a confirmed invalid, her grand-nephew Paul Beling was taken to sing to her and cheer her up. Both grand-aunt and grand-nephew derived much joy from these visits. Hilda enjoyed the singing while Paul enjoyed eating her soft milk toffee which was made especially as a treat for him. 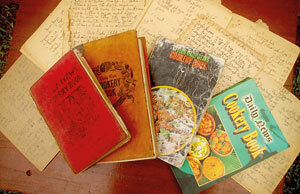 Cookery Books are useful props for constructing a national cuisine and thereafter a national culture. The ‘authenticity’ of the recipes influence the process of what Benedict Anderson terms ‘imagining the nation’. According to Igor Cusack, the very action of naming a national dish (kiribath,biriyani, lamprais) is a method by which to flag the nation. Would Hilda Deutrom have seen her literary work on local cuisine as a prop in the construction of the Sri Lankan nation? 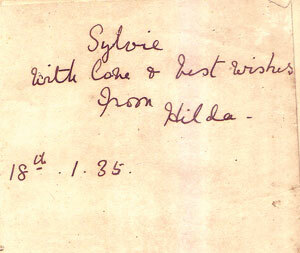 In her preface to the First Edition, Hilda revealed another purpose behind the publication of the Ceylon Daily News Cookery Book. She compares the collectors of a country’s folklore to the collectors of a country’s indigenous recipes and argues that a “representative list of the recipes handed from generation to generation … reflect the march of the island’s history”. From Sinhalese and Tamil dishes to Eastern delicacies introduced by the Arabs, Malays and Moors, peppered with the influences of the Portuguese, Dutch and British colonizers, this is a Cookery Book which ‘endeavours to preserve all the best recipes handed to the present by past generations’.